It’s not much of a stretch to draw comparisons between the storehouses of ancient times and the Outreach warehouse space that provides storage for the food donations that the Mission receives throughout the year. Like the cycle of growing seasons, many of the staple food items at the Outreach warehouse, such as canned goods and cereals, that were received earlier in the year have been depleted by harvest time, finding their way to the kitchens at our men’s and women’s shelters or to a family in need by way of an Outreach partner organization. Thankfully, we know that God remains faithful in times of abundance, but most importantly in times of scarcity and need. 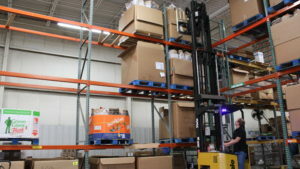 For the past several years, Bethesda Mission has helped to organize and participated in the Rescue Mission Food Drive each fall, and the public — along with charitable business partners like M&T Bank, Turkey Hill, Karns, and Sun Motor Cars to name a few — have faithfully provided food provisions and resources to once again fill the storehouse. The constant need for healthy food options at our shelters doesn’t go away. Currently, on average, the mission serves over 10,000 meals every month—yes, that’s right more than 10,000!—to nightly guests eating at the soup line; the men and women in our long-term recovery program; youth taking part in activities at our community center; and homeless men and women being served on the streets by Mobile Mission. “An increasing and changing issue that our staff sees more and more at our soup line each day is the number of folks coming in with young children. Several mothers have shared with us that, during the summer months, the Mission is essential for them to be able to feed their children because the ‘free lunches’ offered at school aren’t available. Hunger is not just a homeless issue but a low-income issue too,” explained Bill Christian, Director of Men’s Mission. The Rescue Mission Food Drive provides a great opportunity to support Bethesda’s unending efforts to feed those in need at our Harrisburg locations and beyond. There are two important ways to contribute. In years past we focused entirely on collecting non-perishable food items. 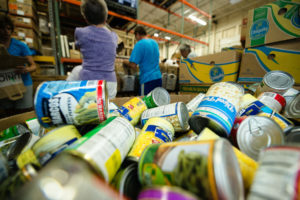 While this continues to be a great way to contribute, we also feel that it is absolutely necessary to emphasize our huge need for monetary donations to sustain our necessary food purchases throughout the year—food items like meats, butter, and fresh fruits and vegetables, which typically aren’t donated directly to the Mission in large quantities. If you’re able to impact our food needs with cash or a check, we ask that you specify that you would like your contribution to be put toward future food purchases by including a note along with your donation, either on the memo line of the check or separate with any cash donation. Having enough funds on hand to plan for food purchases well in advance frees up dollars that can be put toward programming and the other long-term needs of our guests in recovery who are desiring to make a life change. Plus, you can be confident in knowing that your contribution is being put directly toward feeding the homeless and hungry. We hope you’ll consider contributing to this year’s Rescue Mission Food Drive either with a monetary donation or by purchasing non-perishable food items for the mission at your local grocery store. The food drive runs from October 30 through December 22, 2017. Non-perishable food donations can be dropped off at any M&T Bank, Turkey Hill Minit Market, or Sharp Shopper in Dauphin and Cumberland counties, and at any public library in Dauphin County. If your church, business, or group would like to get involved, please contact us at 717-257-4442 or info@bethesdamission.org.